(CNN) -- Top seed Rafael Nadal continued his dominance on clay with a straight sets victory over defending champion Novak Djokovic in the final of the Rome Masters in Italy. 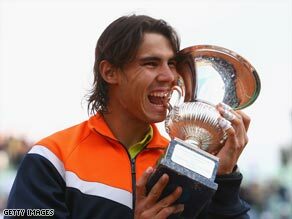 Rafael Nadal in familiar pose after winning the Rome Masters for his fifth tournament victory of the season. The Spaniard secured his 13th victory over his Serb rival in 17 matches with a 7-6 6-2 win, to capture a record fourth Rome title. "The Rome Masters is a really important tournament for me," Nadal told reporters after claiming his fifth title of the season and his 30th consecutive clay-court victory since losing to Juan Carlos Ferrero in the second round of last year's Rome tournament. "I am delighted to have won again in Rome and to have achieved this record. It's a great feeling to win in front of this crowd. I congratulate Djokovic for a great match, and I will be back next year." In a thrilling first set, Nadal appeared to take command when he broke Djokovic and then had a chance to serve for a 1-0 lead. The world number three, however, broke right back to send the set to a tie-break. Djokovic won the first point but was then guilty of committing numerous unforced errors and allowed Nadal to win the tie-break with ease. The second set was tied at 2-2 before Nadal forged ahead and won the next four games to clinch victory. Djokovic, who made 40 unforced errors, said: "Congratulations to Nadal. He played a great match." The result was also good news for Briton Andy Murray, who moves up to third place in the world rankings after Djokovic failed to defend his title.